The scrub comes in a sizeable squeeze tube with a narrow nozzle that controls even the tiniest amount of product well when dispensing. The tube is secured and has a white flip cap, which is quite sturdy and tight enough. This kind of packing is absolutely travel-friendly. 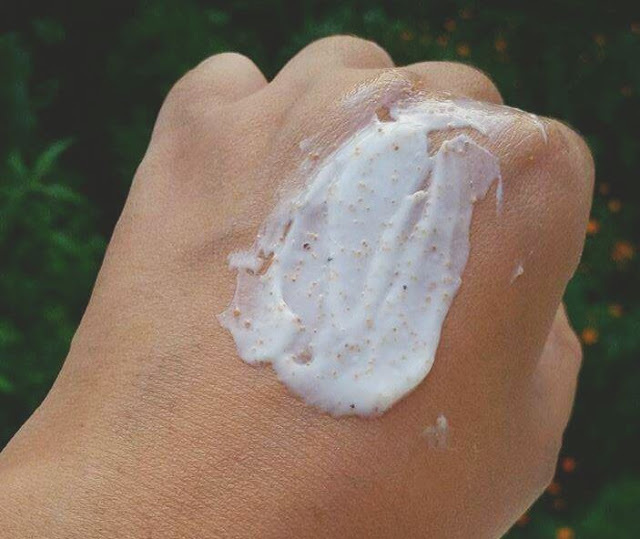 It has a soft and a very creamy consistency with tiny light brown granules of walnut shell particles; the granules are not harsh on my dry skin. The texture is quite thick but it spreads with ease on damp skin. It has very mild fragrance which isn’t too bothering. I've had a few experiences with facial scrubs in the past. I've found many of them to be much too harsh on my skin. However, this scrub has changed my perception on using scrubs as part of my skincare routine. 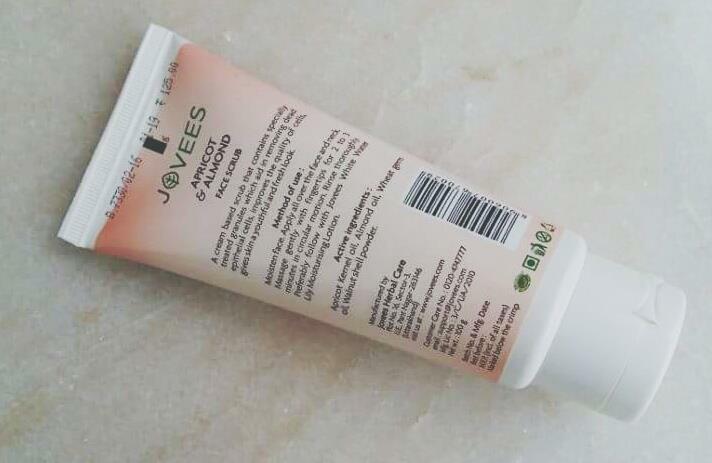 This scrub has a very creamy consistency, which is almost like a cream and gives a moisturizing effect after wash and I don’t feel any dryness on my face. I think this is only because of the presence of almond oil and apricot oil both act as a moisturizer. These scrub particles are enough in number to proper exfoliation for a smoother and clear face. The walnut shell particles are a great natural exfoliating agent that removes dead cells as well as blackheads effectively. It’s very gentle to the skin. After the use of this scrub, I do use very little amount of moisturizer or cream. A real plus point for me is the smell of the product, I like it, and it smells wonderfully fresh. 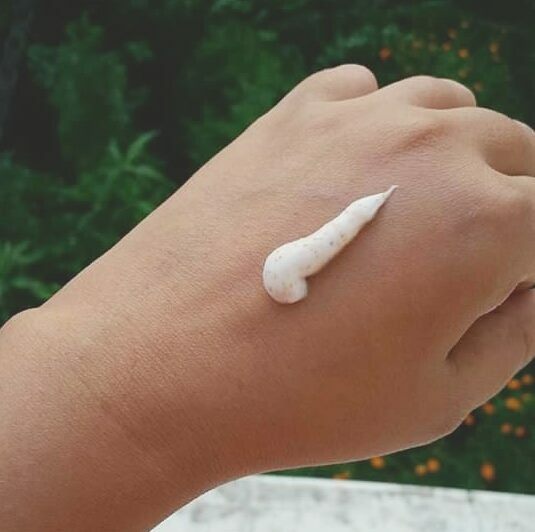 Doesn’t dry out the skin at all. Honestly speaking I don’t have any issues with this scrub. But it can make oily skin more greasy (I guess). Overall, I am quite impressed with this scrub. Jovees Apricot and Almond Face Scrub is a good scrub that is creamy and it removes dead skin cells quite effectively. After every use, it keeps the skin moisturized and fresh. It also has a fresh smell too. 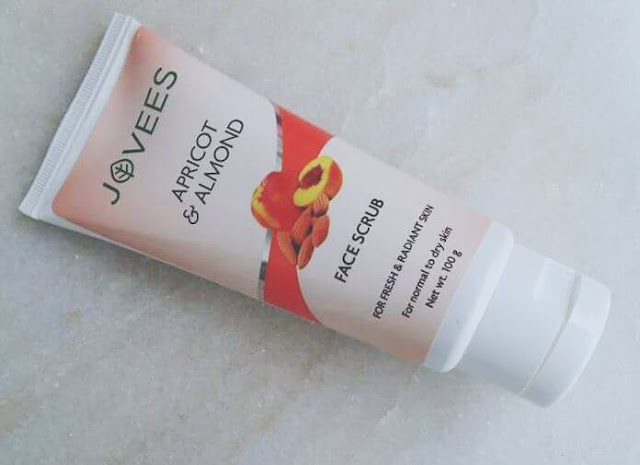 Jovees Apricot and Almond Face Scrub is an incredible product but like what I always say, what works for me might not work for you and vice versa. But I definitely recommend trying out this product, as it is only Rs116 for 100 gm, so if it doesn't work for you, you won't feel bad for throwing it out or use as a body scrub. But I am sure dry skin beauties would love this scrub. Nice review babe! Jovees makes good products, sad that people aren't choosing these over others.